KoopaTV: Details on the Nintendo Labo Kits! By LUDWIG VON KOOPA - Do these more details generate more Labo interest? At the end of last week, apparently to distract from their Bayonetta re-re-release, Nintendo released three (3) new detailed, longer-form videos on the Nintendo Labo. These answer a lot of questions I've had about what exactly you'd be getting if you commit to the Labo's purchase prices, and the value the Labo imparts on its players and builders. I think the most logical way to present you my thoughts is to just go through each video one-by-one and give commentary. I've embedded each of the videos under their respective header, of course. It's the least I could do. As you watch the videos, don't pay attention to how the Nintendo Labo music is basically a remix of the gym theme from No More Heroes 2: Desperate Struggle. 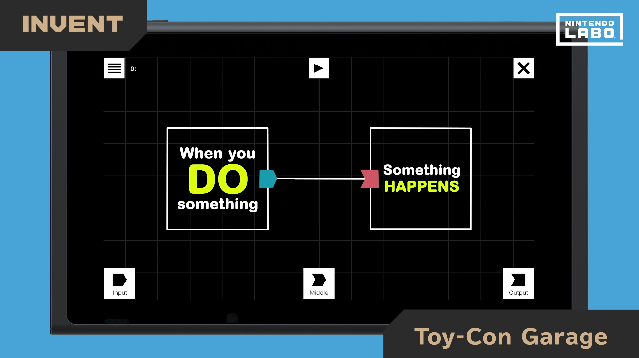 I divided my analysis article by the MAKE, PLAY, and DISCOVER headers, and clearly from the thumbnail Nintendo is sticking with those headers and consistently using the yellow box for MAKE, the pink Joy-Cons for PLAY, and the light bulb for DISCOVER. Good on me for picking up the visual and product messaging themes Nintendo wanted me to pick up on. The real new information that isn't in the other videos below is in the DISCOVER portion in the second half of the overview video. 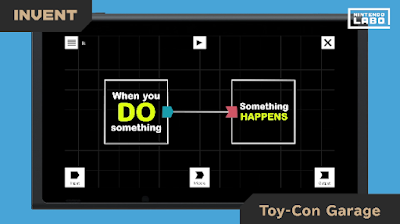 Especially the Toy-Con Garage, which explains Nintendo's statements about building your own experiences. It's the hidden fourth activity: INVENT. Nice simple programming logic. “When you DO something, Something HAPPENS”. They provide examples in the video of such self-invented contraptions, including a Switch-powered cardboard bank full of money, and a guitar made out of a broom and played with a Joy-Con. All thanks to ingenuity and input/output if/then logic? It's a lot lamer writing it out than seeing it on the video, which probably doesn't bode well for how long people will be amused by the Labo. In other words, the fun will be in making the invention, not actually...using it. There are five Toy-Cons you can make from one Variety Kit. The RC Car, the Fishing Rod, the House, the Motorbike, and the Piano. None of these are individually compelling from a software perspective, but maybe combined it could be worth it? Alternatively, they seem like they could be great technologically-powered arts & crafts projects, like the customisable RC Car, or the you-can-make-your-own fish, or the paint-your-house, or the customise-your-racetrack, or the make-your-own-rhythm-cards. 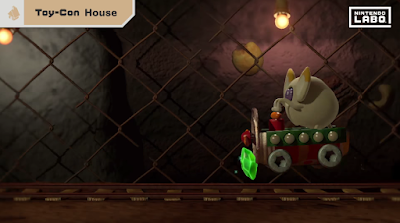 I guess it's better than Yooka-Laylee's minecart game. Apparently the whole point of the Robot Kit gameplay is to destroy the whole town and all of its buildings and cars. It seems like a bad message to send to kids, especially given the rise of domestic terrorism lately. 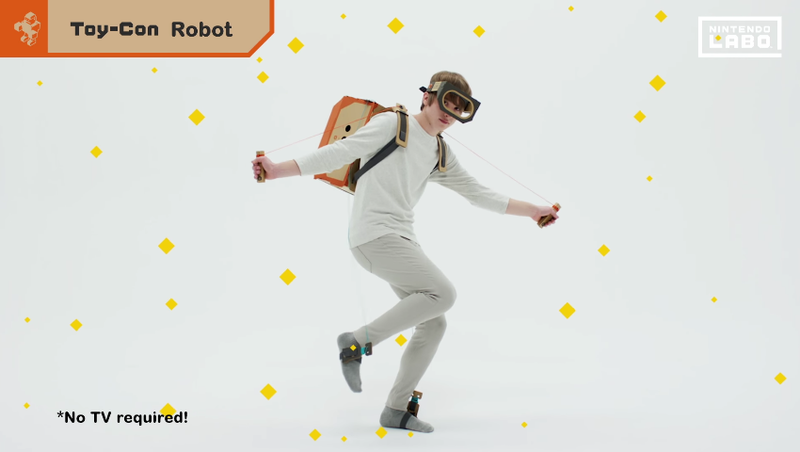 Usually, Nintendo tries to represent both genders whenever they are marketing something, but they're very clearly just going for the male demographic with this Robot Kit. This kid looks like he's going to shoot up a school. Your robot can acquire new skills and moves and you can customise the robot's look, and there is a mysterious Calories mode, but... 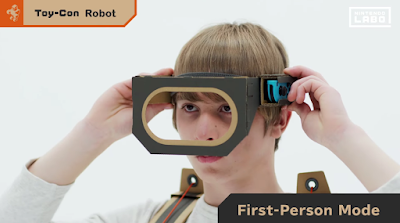 It still looks like Shigeru Miyamoto's “Giant Robot” project. The crappy one. I mean, the robot can even turn gigantic as a special power, so that just about confirms it. Speaking of confirmation, this screen capture makes it clear that this kid is harmless. The Robot Kit is a lost cause to me, and it encompasses much less of the MAKE, PLAY, and DISCOVER (and now INVENT) paradigm that is much more apparent and appealing with the Variety Kit. Somehow, seeing a lot more Nintendo Labo content got Ludwig's writing tone even less enthusiastic about the Nintendo Labo. He doesn't see the $70 going primarily towards software but rather the easy and robust construction kits aided by the digital Nintendo Switch technology. That's fine. What do YOU think of the recently-announced Labo news? Do you have a different opinion than Ludwig? Sound off in the comments section, and maybe while you're spreading your opinions, give the KoopaTV Feedback Forms (and Quizzes) some love. Click here for the very first impression KoopaTV's staff had for the Nintendo Labo. There is a reason why that kid with the Robot Kit looks like a school shooter, revealed upon the Labo's release! If I were a kid, I would much rather get the variety kit because the robot kit is just not too appealing. I would probably spend most of my time customizing motorbike tracks and creating songs on the piano. And how would you feel if you were a squid? Whoa, whoa, stay away from the water! You might die!